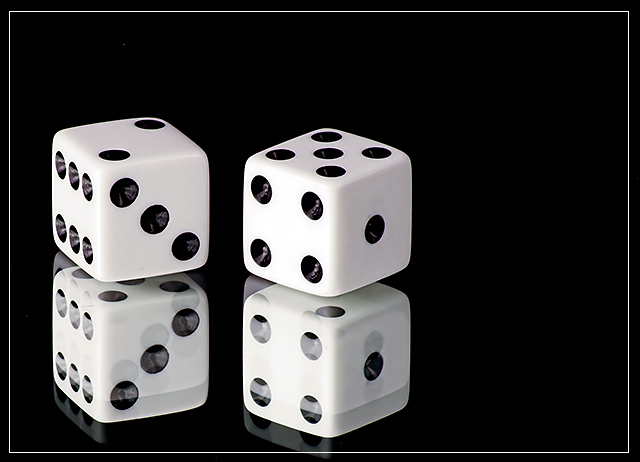 Two black & white dice shot on a mirror with a background of black paper. Unfortunately, the only mirror I had access to was thick, hence the double reflection. Adjusted contrast and white balance in RSE. Further refined contrast in PS Elements, NI, resized, unsharp mask, added 1 px white border. The double reflection bothers me, otherwise good. Using a mirror silvered on top instead of under the glass would remove the double reflection. But nice shot. I think the double reflection is kind of distracting. Otherwise very well done. Good sharp image. Love the double reflection. I like the design of the picture, but the double image of the reflection detracts from the impact of teh picture a bit. A different mirror might of improved this photo. I'm thinking a primary reflective source would have avoided a double image of the lower dice. This is nice. Kicking myself for not thinking of it! ;) Had thought about using dominos...oh well, next time. He-he. You did a good job of controlling your B/W points and color temp. The only thing I don't like is the inside white border cutting thru the reflection of the right dice. Just saw all the sevens. Is there a symbolism to that? Anyway, very nice image. I wonder how many others will add together the dots to get all those sevens. Of course, I need to try this using other numbers. Very creative. Proudly hosted by Sargasso Networks. Current Server Time: 04/21/2019 12:22:03 PM EDT.